Invoice Ninja is a time tracking & invoicing solution for freelancers and entrepreneurs. 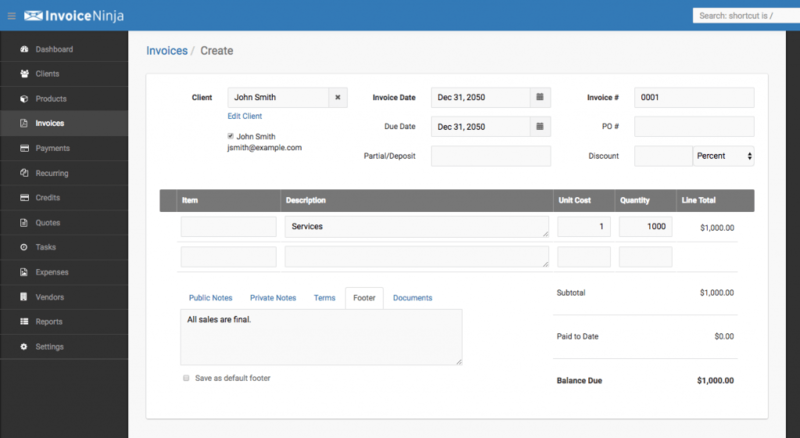 Prepare professional-looking invoices with a few clicks and email them directly to your clients. With over 45 supported payment gateways, you’ll get paid faster with online payment methods including PayPal, Stripe and BrainTree. Each of your clients will have access to a dedicated client portal which clearly lists the invoices they have paid, and the ones that are outstanding. Invoice Ninja is designed to take the pain out of collecting your hard-earned money, by automatically sending reminders to your clients who have outstanding invoices. You can also set up recurring billing for clients who are on a retainer. With certain payment gateways such as Stripe, WePay and BrainTree, you can even auto-bill from a customer’s credit card or bank account via ACH. Accurately tracking billable time is also easier with Invoice Ninja. Simply create Tasks as you work, and log time against the client using the built-in timer. Once you’ve tracked your time, it’s only another click to turn that into an invoice and send it to the client. Of course, if you prefer to consolidate multiple tasks into a single invoice, you can also save it for later. With Invoice Ninja, there are no limitations on the number of clients you can have or the invoices you can send. Once installed, you’ll pay no additional fees for each invoice besides what your payment processor charges you. If you’re paying 20% or more to freelancing sites like Upwork, you can keep more of the money you earn by invoicing your clients through Invoice Ninja. Out of the box, there are 10 invoice templates that you can fully customize with your own logo, business info, colors and typography.